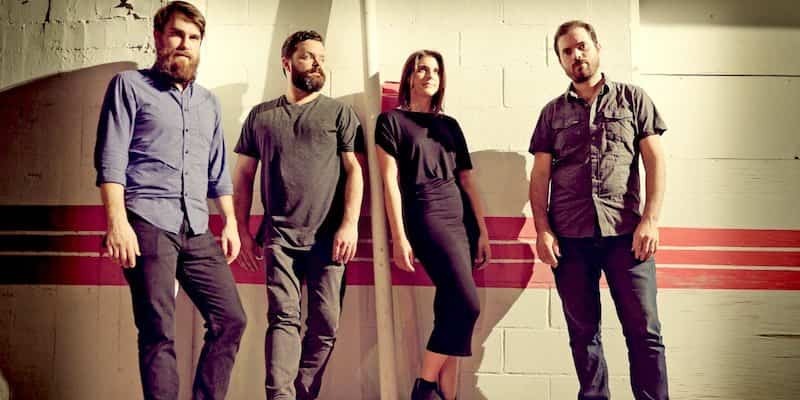 Reddening West is a four-piece alt-folk band based in Austin (Texas). They released earlier this year their debut Ep “Where We Started”. Their melodies are mesmerising and feel infinite. And their lyrics are poetic while remaining profoundly relatable. I recently got to ask Matt Evans (1/4 of Reddening West) a couple of questions. I am so happy to share this interview with you and to put a little spotlight on this incredible band. In this feature, you’ll find out more about their story, music influences and many other cool little things (like why they’re called Reddening West!). And, good news: they’re currently working on some new music! First, thank you very much for agreeing to do this interview. I have been slightly obsessed with your debut EP “Where We Started” since it came out. Let’s talk a little bit about the band and its story first. Could you introduce, in a few words, each member of the band? Niamh Fahy – violinist, keyboardist, composer, etc. Niamh is originally from Ireland and came to Austin by way of London. Kevin Butler – drummer, producer, engineer, etc. Kevin was born in Florida but has lived in Austin most of his life. Todd Horner, bassist and band humorist. Todd is originally from Waco, TX, right up the road from Austin. Matt Evans, vocals, guitar, etc. Originally from Arizona, now in Austin, with a few stops in between (most notably a good amount of time in Seattle). How did you meet? Did the idea of forming a band come up quickly? Listening to your EP makes me feel like it was meant to be. Niamh and I met first soon after she had moved to Austin from London and we talked about wanting to collaborate – we were both looking to start something new and shared a vision for what that could be, and we hit it off. I had a few songs sitting on the shelf, so we started working together in 2015, developing the songs that would become this first EP. We were practicing at their house, so Kevin heard what we were up to and offered to join us. The rest is history. Todd is a long-time friend and joined up earlier this year. It does feel like it was meant to be – it all came together very naturally and it feels like a family. I feel really fortunate to have met these folks and have the opportunity to write songs with them. Your sound is already very distinctive. The arrangements in the debut EP are absolutely stunning! How would you describe your music? And would you say you found your sound quickly? Wow, well thank you for saying so. I’m not sure how we would describe it. I guess it’s kind of a mix of all of our influences that creates a sort of expansive, dark folk sound. The new music we’re working on is definitely taking this sound and expanding it even more, adding more depth to it, more texture. We’re really excited about it. We found our sound fairly quickly – it’s really just what came out when we started playing together. We went to record the EP pretty quickly, and we recorded it live, so it’s a pretty accurate representation of what we sound like. What song would you choose to introduce your band to a new listener? I think ‘All You Need’ would be a good introduction. Can you remember the first song you did together? Is it on the EP? I’m pretty sure the first song we did together was ‘The River’, which is the third track on the EP. If we talk music inspiration, I’m sure each member has her/his own favourite. But is there an artist/band who influences you all musically? There’s a pretty wide range. I would name artists like Grizzly Bear, Andrew Bird, Feist, Sam Beam, The National, etc… as influences- but that’s just scratching the surface. So much old and so much new finds its way into the “influences” category. And we find a lot of inspiration beyond music -literature, film, the outdoors. I do remember during the time we were in the studio we were listening a lot to Other Lives, Mimicking Birds, and Damien Jurado- I’m not sure if any of that is coming through, but for some reason I remember those being present at the time. And lyrically speaking, is there a songwriter you look up to? Far too many to name them all. Folks like Bob Dylan, Lennon/McCartney, Paul Simon, Sam Beam, Lucinda Williams, The Tallest Man on Earth, Feist, Josh Tillman, Matt Berninger, Elvis Costello, Neil Young, Joni Mitchell, etc. I’m sure you get asked that too often, but why the name Reddening West? The name comes from the way Cormac McCarthy describes the “reddening of the sky”, the setting sun, in some of his books that take place in Texas and the Southwest. This represents a lot of things for us: the end or the beginning of things, the coming of night, the hope of a new day and also the sadness and loneliness of ensuing darkness. It is at once foreboding and comforting. I can’t emphasize enough how much inspiration we draw from nature and place. The Southwest, the Austin area and Hill Country, Ireland, and the Pacific Northwest all represent very special landscapes to us. I don’t think we realized it during the writing process, but so much of the dry, earthy simplicity of this Texas landscape infiltrated our songs. I think something of all of the places we’ve lived have made their way into this collection somehow. We felt like the name was a good fit. The general tone of the debut EP is not exactly uplifting (and I do not mean that in a bad way!). Songs like “Golden Light” and “Every Wind” are hauntingly beautiful (and really touching). What are the themes and the inspirations of the EP? There’s a darkness to our music for sure. The most impactful stories to us – whether in film, literature, or visual art – try to shine a light on the darkened corners of our emotions and our experiences. I think exploring the difficult and traumatic things we experience is what resonates with us lyrically and musically – when we strike an emotional nerve within ourselves, we know we’re onto something we like. I think the songs deal with feelings of loss and fear of change, nostalgia, how time and experience shape us slowly, almost invisibly. Yeah, definitely not very uplifting stuff at all. Is there one song that was particularly hard to finish (in the studio or while writing it)? ‘Golden Light’ was pretty hard to finish – partly because we changed the arrangement a few times, which then changed the arc of the lyrics. So, trying to get that right was difficult. But we’re happy with how it turned out in the end. Do you have a favourite in the EP (like a song that has a particular meaning for some/all of you)? I wouldn’t say there’s a favourite necessarily. ‘Handful of Dust’ is a remarkably personal song for me. I would also say ‘The River’ is special to us since it’s the first song we wrote together. How different has the whole experience with Reddening West been compared to other music projects (e.g. bands) you’ve been involved in? We’ve all been in a lot of different projects, and I think we know how rare it is to find a group of people who all share a vision about the sound and path you want your music and band to take. I think our respective talents compliment one another, and I know I’ve become a better musician by having the opportunity to play with this group. We work really well together. I also think we all share a mindset about pursuing music. We’re all working different jobs, so the time we do have to create is really sacred. This project feels much more focused than anything I’ve done before. Do you have any new music/other project in the work you can tell us more about? We’re working on new music as we speak – we’re not sure what shape it will take yet, but there’s a lot pouring out of us at the moment. We’ll probably have something to share in early 2017. We’re also all involved in other projects – a few worth mentioning would be Black Books, Sleepy Holler, The Here and Now, and The Whalers. Thanks and best of luck with everything! Check out Reddening West’s music on Bandcamp.